Tracy Lazonby. Final Journey is Tracy’s creation, and she is the person that you will deal with throughout, from the first phone call through to the time after the funeral, when she can suggest local support groups if needed. When you meet Tracy, it’s as if you’ve known her for ages – she’s warm and friendly and has a natural way of putting people at ease. Her philosophy is simple – treat people the way you wish to be treated yourself – and you instantly feel that she gets it, she understands, and is there to help guide you through the myriad of decisions that need to be made when someone has died. And she wants clients to feel in control – this is something that is really important to Tracy, and everything about Final Journey is geared to ensuring that clients feel that they are in charge of what happens, that they choose what works for them. It’s a simple yet profound approach, the polar opposite of some more traditional funeral directors, whose way of working is to try and take care of everything for you. Tracy encourages you to think about what you need and she can help suggest ways to do this. ‘Carrying the coffin: You can carry the coffin or we can do it for you or we can all do it together’. Simple, but so powerful. Putting you and your feelings about the person who has died right at the heart of everything. This is Tracy’s approach, and this is what makes her so good. She gets what matters, that each funeral needs to be created and conducted according to the culture, customs and language of the family involved, and she sees her role as helping you to achieve this. One of the reasons that Tracy has such insight into the complex needs of people who have been bereaved is that her life has been very much shaped by the deaths of people close to her. She created Final Journey after the death of her mother, six years ago, but, as she says ‘I have lived in the shadow of death my whole life’. Tracy’s father died suddenly, when she was just fourteen, and this huge loss and trauma was compounded by her mother’s illness, which had been diagnosed some years earlier, and which had caused her to become a young carer. When her dad died, Tracy had to try and deal with her own grief while also trying to protect and care for both her mother and her younger sister. She had to almost become the father figure in the family, and this responsibility was one that she carried for years, influencing many of the choices that she made in her career and work life. She had all kinds of experiences, flying as cabin crew, working for Estée Lauder, working for a Health and Safety company at the time of the foot and mouth outbreak, serving as a Special Constable for the local police force – all combining to make her a rounded, capable person, who is really good with people. Looking back, everything she has done over the years helped her acquire the skills needed to make a really good funeral director – the customer service skills, the attention to detail, the logical, organizational skills, the awareness of the importance of Health and Safety – and the ability to connect with people from all walks of life. Without realising it at the time, throughout her life, Tracy had been learning everything she needed to know to make Final Journey work. And it was when her mother finally died (a death that was welcomed because her quality of life was so poor at the end), the idea for Final Journey became reality. So with these thoughts in mind, when she created Final Journey, Tracy used all her own experience to shape the type of business that she would have wanted to find herself. A funeral director that focused on what she needed, not ‘how it’s always done round here’. A personal service from someone who listens and makes suggestions without any pressure. A thoughtful, kind approach with attention paid to little details that perhaps wouldn’t have been thought of. A human, gentle and professional company that gives extraordinarily good value for money. With the support of her husband Mike, Tracy set about converting part of their home into the Final Journey premises. Completely separate from the hubbub of family life in the rest of the house, and with its own entrance, there is a dedicated office area for families and a private space where you can spend time with the person who has died. Beautifully and stylishly decorated, with comfortable chairs and fairy lights in lanterns, the entire space is quiet and peaceful, with an immediate feeling of calm. Cleverly, and unobtrusively, what appear to be cupboard doors on one side of the room actually open into a spacious fridge, where several people can be kept cool until the day of their funeral. Trestles and stretchers and all the various bits and pieces that are needed by undertakers behind the scenes are kept in a further room out of sight, and coffins are ordered individually as clients choose them, meaning that storage requirements are minimal. Tracy has a small desk but comes to sit at the coffee table with clients when they visit, although the vast majority of people prefer Tracy to come to them to talk about the funeral arrangements. When Tracy collects someone from where they have died, she always calls her client to let them know that they’re home with her. Many people mention this in the numerous testimonials left on the Funeral Advisor website– it obviously means a lot to receive that phone call. And she cares for everyone in the same gentle way. She washes and dresses them herself, and one of her friends is a hair stylist who often comes in to make sure that the person who has died has their hair done properly, and Tracy has an impressive collection of make-up which she applies with skill when needed (that training with Estée Lauder didn’t go to waste). As for the types of funerals that Tracy offers – well, she can do whatever kind of funeral you want. If you want shiny black cars you can have them, no problem at all. There will be an additional hire cost, but that’s all laid out on her website and in her price list, so you know what this will be when you choose. Different styles of coffins are shown (with their prices) on the website so you can pick the type you prefer. Costs are transparent, and easy to find – an inclusive price for either burial or cremation at Carlisle Cemetery or Crematorium is shown, with what’s not included clearly listed in each case. If you want the funeral to take place elsewhere, then Tracy will obtain the costs for you and calculate the price for her services. If you don’t want to use Final Journey’s gold Mercedes Vito (included in the figure quoted) then you’ll just need to add on the cost of whichever alternative transport you prefer, along with the coffin of your choice. It’s all very straightforward and simple, and puts you very much in control of how much you want to spend; by adding items to the online ‘Wish List’ you can have an instant calculation of the costs involved, with no obligation (or even conversation if you don’t want one at this stage). On the website, there are two really helpful downloads – ‘My Funeral Wishes’ is a useful checklist to help ensure your wishes for your funeral are recorded, with a note to remind you to keep it in a safe place once completed and also, most importantly, to tell someone close to you where it is. ‘When Someone Dies’ is a comprehensive four page document giving lots of information about what needs to be done after a death has occurred, and phone numbers for local register offices. 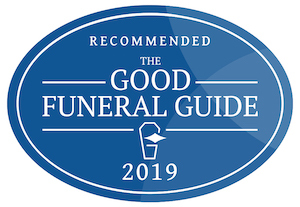 As mentioned above, there are also a lot of helpful suggestions and ideas about the funeral itself, all intended to put you in control of what happens and how it’s done – and available for anyone to take inspiration from, even if they aren’t choosing Final Journey as their funeral director. Recognising that everyone is different, and needs different types of support – Tracy is really good at listening and understanding what clients need from her, and then tailoring her support to a level that is right for you. This has the result of putting every client in charge of the funeral they are arranging. If this sounds daunting, it’s not. Tracy is there to support each of her clients, holding hands if need be to ensure that each one feels they are being helped by a friend who knows the pitfalls to avoid. She stays in contact throughout your dealing with her, and knows every detail of every funeral arrangement inside out. It was Tracy who brought direct cremation to the area by actively promoting it as a choice for some. She’s very clear about the difference between direct cremation and other types of funeral, giving details on her website, along with the reassurance that ‘we always make sure everyone knows the date and time the cremation will take place so that they can just be still and take a moment to send their thoughts and prayers if they wish’. Little touches that make all the difference. For example, Tracy has loads of different sizes of candles (battery powered ones) which get placed around each coffin at the funeral ceremony, to give a sense of the person who has died being surrounded by light and love. All of the details matter – Tracy knows how important it is to get everything right. She has a selection of scarves and floral corsages to match different colour themes at funeral ceremonies, a simple, subtle touch that might not be noticed by everyone, but connects her with the mourners in a thoughtful way. Tracy’s is just normal. She’s lovely and friendly and stylish and confident, but overwhelmingly she’s just normal, like one of your friends. She talks normally, not in euphemisms or strange funereal phrases, and she behaves normally. She dresses normally too, no uniform or intimidating barriers of formal dress, just smart, normal clothes. She’s practical and capable and sensible and straightforward, and she has created a funeral company that reflects her ethos and personality perfectly, the kind of funeral company that didn’t exist in Carlisle when she needed it. Many of the traditional funeral directors in town thought that she wouldn’t last when she launched Final Journey. Now, most have begrudgingly eaten their words, and she has earned the respect of her peers, even those who work in very different ways. Your first callwill be answered Tracy. Home visits – yes definitely, Tracy mostly visits people at home to talk about arrangements as she’s found that most clients prefer this. Embalming? Not usually. Tracy doesn’t offer it but can arrange it if necessary. Ethnic specialism? Happy to serve clients from all cultures and ethnicities. Home arranged funerals – Happy to assist as much or as little as needed where clientsare looking after the funeral themselves. Local celebrants – Tracy has an excellent and varied selection of celebrants and will always try and match the right officiant with each client. Vehicles– Gold Mercedes Vito. Any other type of hearse can be hired for you, as can limousines if you want them. Website– Lovely website, fresh, attractive and informative, with a price calculator and downloadable documents that you can print out and complete. Client support – Personal support from Tracy throughout your contact with her. Money matters – All Final Journey prices are online, clearly explained and broken down. Excellent value for money particularly given the personal service you will receive. Parking–on street parking outside Tracy’s house. (Access to the Final Journey entrance is down the drive rather than along the path). Final Journey has become exactly what Tracy set out to create, a flexible, transparent and personal service that will provide exactly what you need from a funeral. Tracy has used her skills, knowledge and all of the experience she’s gained throughout her life to create exactly the kind of funeral director company that she would have loved to find to support her when her beloved mother died. If you need to find a funeral director in the Carlisle area, and if you are looking for someone who will really listen, and who will really be able to understand what you need to help you create exactly the kind of funeral you want, then we can’t think of anyone better than Tracy Lazonby at Final Journey.